What Is Scoliosis?Scoliosis refers to a sideways curvature of the spinal column. The architecture of the spinal column is normally straight. Scoliosis is a primordial disease dating back to the ancient Hindus. Screening by qualified medical personnel during puberty usually reveals the disease. The disease is usually mild, but sometimes can affect individuals severely. 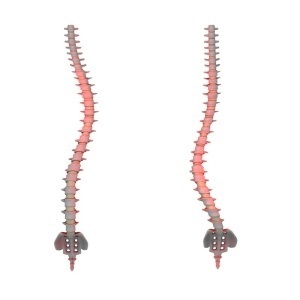 Scoliosis is the most prevalent malformation of the spine and currently affects approximately six million in the U.S. It occurs more often in girls, as opposed to boys. Disease progression is also more common in girls. Most, however, have a mild form of the disease and require no major treatment. Some clues pointing to the diagnosis of scoliosis include uneven shoulders, a prominent scapula (shoulder blade), uneven waist, and leaning to one side. Pain is not a typical symptom of scoliosis. Neurological deficits are also not part of the symptomatology. Abnormal school screening usually raises the specter of scoliosis. The diagnosis can be confirmed with a thorough physical examination and spinal X-rays. Spinal curvature can also be quantified with X-ray. Most patients have spinal curvature less than 40 degrees. Surgery should be considered in patients whose spinal curvature is more than 40 degrees. MRI and CT scans sometimes play a role in diagnosis. Curves can go left (levoscoliosis) or right (dextroscoliosis). Congenital scoliosis develops when a fetus is in the womb. Its origins are in a bone abnormality present at birth. Neuromuscular scoliosis, or myopathic scoliosis, develops in those born with neuromuscular disorders such as muscular dystrophy or cerebral palsy. Causation can be traced to abnormal muscles or nerves. Degenerative scoliosis, or adult scoliosis, is diagnosed in an older subset of patients secondary to trauma, spinal surgery, or osteoporosis. The most prevalent type of scoliosis, idiopathic scoliosis, has no known cause. There is substantive evidence confirming a possible link between idiopathic scoliosis and heredity. The disease occurs in 2% of the population. It is uncommon for scoliosis to be related to a tumor of the spine or neurological disease. Other factors may play a role in the development of scoliosis. Studies have shown links to internal influences and abnormal child development. The roles they play in spinal distortion are unclear at this time. Several factors should be taken into consideration when making decisions about scoliosis treatment. Most of the adolescent idiopathic scoliosis patients require only observation. Groups of patients with moderate scoliosis (25-40 degrees) usually require back bracing. Popular back braces include the underarm, or low profile, brace and the Milwaukee brace. Length of time in braces varies from overnight to 23 hours per day. Bracing has been shown to have no effect on the advancement of spine curvature. Patients with severe scoliosis (>40 degrees) may require surgery. The procedure of choice is spinal fusion. Fusion decreases curvature and also stops the promotion of curvature. Adverse outcomes of surgery may be paraplegia, hardware failure, hemorrhage, infection, and advancing disease despite the intervention. Alternative treatments for scoliosis may include biofeedback, electrical stimulation of muscles, and manipulation by a chiropractor. Scoliosis, or abnormal curvature of the spine, is a prevalent disease and also is the most commonly diagnosed spinal abnormality. Over the years, school screening programs have bolstered the diagnosis of the disease. There are four types of scoliosis (congenital, neuromuscular, degenerative, and idiopathic) and each has its own origins or explanations. Treatment options for scoliosis include surveillance, back bracing, and spinal surgery. Many factors have to be taken into consideration when treating scoliosis. Geissele AE, Ogilvie JW, Cohen M, et al. Thoracoplasty for the treatment of rib prominence in thoracic scoliosis. 1994;19:1636–42. Kesling KL, Reinker KA. Scoliosis in twins: A meta-analysis of the literature and report of six cases. 1998;22: 2009-14. Korovessis P, Piperos G, Sidiripoulos P, et al. Adult idiopathic lumbar scoliosis. 1994;190:1926-32. Lonstein JE. Idiopathic scoliosis. In: Lonstein JE, Bradfordn DS, Winter RB, Ogilvie J, eds. Moe’s Textbook of Scoliosis and Other Spinal Deformities. 3rd ed. Philadelphia, Pa:. WB Saunders Co;1995:219-256. Owen R, Turner A, Bamforth JS, et al. Costectomy as the first stage of surgery for scoliosis. J Bone Joint Surg Br. 1986;68:91–5. Reamy BV, Slakey JB. 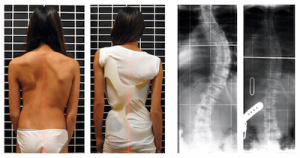 Adolescent idiopathic scoliosis: review and current concepts. Am Fam Phys. 2001;164:111–6. Wong MS, Mak AF, Luk KD, Evans JH, Brown B. Effectiveness of audio-biofeedback in postural training for adolescent idiopathic scoliosis patients. Prosthet Orthot Int. 2001;25(1):60-70.